originally uploaded by cast on cast off. Had a jaunt to a charity shop this morning and had a ball. I got heaps of stuff. Loads of vintage knitting patterns, 7m of pale blue ric rac, fabric, felt, elastic and these fabulous buttons. They were filthy when I found them lurking at the bottom of the box. I cleaned them up with some washing up liquid and an old toothbrush. Good as new. I did the hot water test on them and they’re definitely casein. They smell like old socks! Started Mist last night and is coming along nicely. Doing a sleeve first – just to mix things up a little. 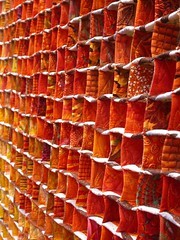 Had a fantastic time at the Festival of Quilts this past weekend. It is always an inspiration. So many talented people there with their work. The highlight was Joan Schulze’s retrospective – mindblowing. I was sneaky and took a shot of Steve Martin’s brain. Got lots of bits and pieces. You can see some marbled fabric in the card I made for a friend. Lots of projects all lined up for the winter! This is my favourite shot of the festival.